From the Saco Museum: After the Saco Museum's successful 2013 sampler exhibit, "I My Needle Ply With Skill," and the book by the same title, the museum has been recognized as an important repository for and center of scholarship on northern New England samplers and silk embroideries. This spring and summer the museum offers a second exhibit on schoolgirl needlework, with extensively researched and documented samplers and silk embroideries from Maine and New Hampshire. More than 130 important northern New England samplers are on exhibit including forty-one samplers from Maine and ninety-five from New Hampshire. 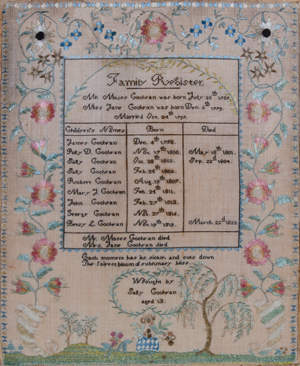 Notable Maine needlework in the exhibition includes two almost identical samplers completed by twins Flavilla and Mary Jane Barker in Portland in 1818, reunited for the first time in nearly 190 years, as well as works from the schools of the Misses Martin and Rachel Hall Neal. "Industry and Virtue Joined" also features what is most likely the largest group of New Hampshire samplers ever gathered together in a single room. The exhibition includes twenty-one samplers from Portsmouth, significant examples of schoolgirl needlework from the Canterbury area and Pinkerton Academy in Londonderry, as well as many beautiful works from small towns across both states. A full-color catalogue of the exhibition will be published mid to late summer 2015. Don't miss this chance to see never before exhibited samplers from the tail end of the 18th century through the mid 19th century and learn about the female academies in which they were created. Miss Cutter, Detail of silk embroidery from "The Lily and the Rose"